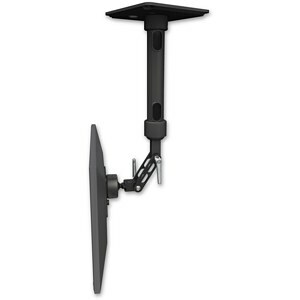 Ultra 500i Ceiling Mount | ICWUSA.com Inc. The Ultra 500i Ceiling Mount offers a wide range of tilt and pivot options that adjust easily and lock into position. The arm swivels 360° at the base of the pipe. Monitor rotates, pans and has 180° of screen tilt. The Ultra 500i mounts from the ceiling on a heavy duty extension pipe. True 2″ outer diameter structural tubing provides side load support. Ceiling extension pipes are available in three lengths. The Ultra 500i Ceiling Mount is machined out of aircraft quality aluminum for strength and durability. Designed, engineered, manufactured and hand-assembled with complete attention to detail. The Ultra 500i Ceiling Mount will provide years of dependable service. The Ultra 500i Ceiling Mount supports up to 18 lbs (8.16 kg). ICW’s ball VESA attachment enables 6-way tilt, pan and rotate of the monitor for best viewing angles. Internal cable management maintains a neater appearance and simplifies cleaning. Ceiling extension pipes are available in 12″, 24″ and 36″ lengths.